Even the demon has left Rashoman when he saw the viciousness of man. I genuinely like Ran are among my top classic films. Rashomon won't be with them. While both Robert Altman and Roger Ebert seem to be rolling naked on their copies of the new Criterion DVD of Rashomon, I myself cannot seem to understand it no matter how smart I want to be. 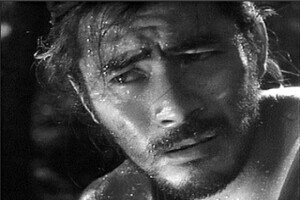 For me, Rashomon was a movie about sweat. I think I get the idea of Rashomon from what little I read. The same story told from four different people with no real truth. I like Toshir� Mifune as much as I do in his others, but he has no where near the charisma that he does in Yojimbo, Sanj�r�, or the Samurai Trilogy. The characters are all pretty good, but there is a whole lot of looking around that padded the 89 minute film. The story all makes sense until some wacky baby is found, adding some question of life and morality into a picture that is already pretty hard to get. Not a lot happens in this movie and there is no single story. We aren't even sure why we are being told the story except to entertain three dudes hanging out in the rain. There are some great scenes in Rashomon that hit me well after I watched it. During one recount of a duel by one of the participants, the two warriors cross swords 23 times in a great display of swordsmanship. A later recounting from a third party observer show the two "swordsmen" as being so terrified at the idea of a fight that when the heroine screams they both practically drop their swords and run into the woods. I was reminded of Pulp Fiction where Butch's killing of Vincent Vega is triggered by the ejection of pop-tarts out of the toaster. The DVD is a solid Criterion release. There is a good introduction with Robert Altman and a commentary track that perhaps someday I will listen to. The picture is in the native aspect ratio of 1.33 to 1 and the sound is recorded in mono. I won't fault that upon the DVD rating since that is how it was originally produced. It is as solid as we would expect from a Criterion release and one I am proud to have on my shelf even if I don't understand it. Perhaps I have a long way to go as a film buff. Movies without stories, unless they have enough interesting threads and lesbians to keep my interest like 8 1/2. I want to like these classic films. I want to feel the same charge that other reviewers seem to, but for some reason I don't. Quite possibly I am a member of the Pearl Harbor audience who saw a poster for something better but can't get himself into the seat.